Combine the milk, ¾ cup of the sugar, 1 cup of the cream, and the salt in a medium saucepan. Heat over medium-high, stirring occasionally, until the mixture is warmed through and small bubbles appear on the surface. Meanwhile, pour the remaining cup of cream into a bowl and set a fine mesh sieve over the top. In a separate medium bowl, whisk the egg yolks until smooth. Slowly pour the warm milk mixture into the bowl with the egg yolks, whisking constantly. Return the entire mixture to the saucepan and place over medium heat. Cook, stirring constantly and scraping the bottom of the pan, until the mixture thickens slightly and coats the back of a spoon (170˚-175˚ F on an instant read thermometer). Pour the custard through the mesh strainer into the bowl with the cream. Stir in the vanilla, lemon zest and lemon juice. Let cool slightly, then cover and refrigerate until completely chilled. Freeze in an ice cream maker according to the manufacturer’s instructions.Line a chilled 9 x 13″ pan with plastic wrap. 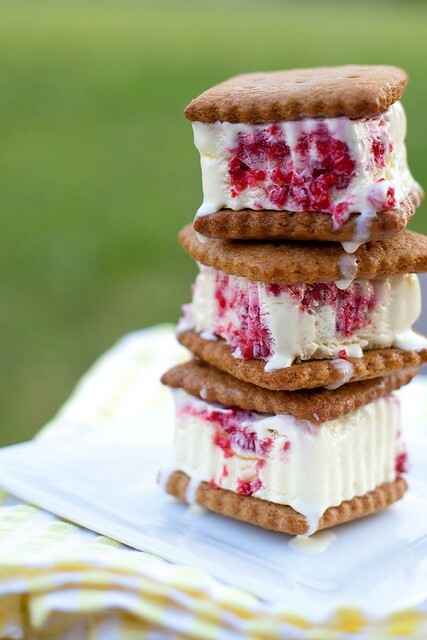 While the ice cream is churning, combine the raspberries with the remaining 2 tablespoons of sugar in a small bowl. Mix to combine, mashing slightly. Let stand to macerate slightly. When the ice cream has reached a soft serve consistency, spread some of the ice cream into the pan in an even layer about 1 inch thick. Top the surface of the ice cream with dollops of the raspberry mixture and lightly swirl into the ice cream with a skewer or knife. Freeze until firm. To assemble the sandwiches, use the same cookie cutter that was used for the cookies (if homemade) to cut out square pieces of ice cream. Layer one piece of ice cream between two of the cookies and return to the freezer immediately. Wrap the sandwiches individually as desired. Keep frozen until ready to serve. The ice cream is so pretty! Love the flavor combination too! These look great!